The consequences of poisoning with inorganic mercury include a mild sensorimotor peripheral neuropathy, a syndrome which may resemble motor neurone disease, tremor (often circumoral), stomatitis, skin rash, and a neuropsychiatric syndrome characterised by timidity, seclusion, easy blushing, irritability, quarrelsomeness and mood lability (erethism). Hatters were liable to such problems because of the use of mercury in the felt hat industry as a stiffener of rabbit fur, leading to the expression “as mad as a hatter”. Hence it might be assumed that Carroll’s Mad Hatter is “mad” because of mercury exposure. 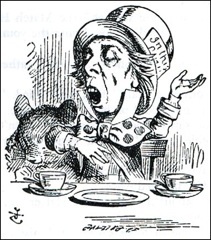 However, as Waldrom pointed out, odd though his behaviour certainly is, the Mad Hatter displays none of the typical features of mercury poisoning, either at the mad tea party (Alice’s Adventures in Wonderland, chapter 7), or during his appearance as the King’s Messenger Hatta in Through the looking-glass (chapters 5 & 7). Tenniel’s illustration of the Mad Hatter/Hatta is said to resemble one Theophilus Carter, a furniture dealer near Oxford, who was known to Dodgson, and known in the locality as the Mad Hatter because he always wore a top hat and was prone to eccentric ideas.